The Palm Beach Post is an American daily newspaper serving Palm Beach County in South Florida, and parts of the Treasure Coast. As of 2016, it was the seventh largest in Florida. 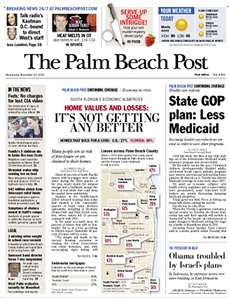 Nearly half of the adults in Palm Beach County read The Palm Beach Post in print or online. The Palm Beach Post began as The Palm Beach County, a weekly newspaper established in 1910. On Jan. 5, 1916, the weekly became a daily, morning publication known as The Palm Beach Post. In 1934, Palm Beach businessman Edward R. Bradley bought The Palm Beach Post and The Palm Beach Times, the afternoon daily (except on Sunday). In 1947, both were purchased by longtime resident John Holliday Perry, Sr., who owned a Florida newspaper chain of six dailies and 15 weeklies. In 1948, Perry purchased both the Palm Beach Daily News, the main newspaper for the island of Palm Beach, and the society magazine Palm Beach Life. In June 1969, Cox Enterprises, based in Atlanta, purchased Perry's Palm Beach and West Palm Beach publications and formed Palm Beach Newspapers, Inc. Cox was founded by James M. Cox, a former Ohio governor and the 1920 Democratic presidential candidate who built a media company that today includes daily newspapers; weekly newspapers, radio and television stations; U.S. cable TV systems, local Internet media sites and Mannheim auto auction locations. In 1979, The Palm Beach Times was renamed The Evening Times. In 1987, The Evening Times and The Post merged into a single morning newspaper under The Palm Beach Post name. In 1989, all of neighboring sister publication Miami News assets and archives were merged with The Palm Beach Post upon the closure of that paper. In 1996, The Palm Beach Post sponsored Scripps National Spelling Bee winner Wendy Guey. Palm Beach Post photographer Dallas Kinney won the 1970 Pulitzer Prize for Feature Photography for his portfolio of pictures of Florida migrant workers, Migration to Misery. Post photographers have subsequently been Pulitzer finalists three times. Editor Edward Sears won the Editor of the Year award in 2004 from Editor & Publisher. Sears led the Post newsroom from 1985-2005. On Oct. 31, 2017, Cox Media Group announced its plans to sell The Palm Beach Post and Palm Beach Daily News. In 2018, it was announced that GateHouse Media would buy the newspapers for $49.25 million, with the deal closing on May 1. In March 1996, PalmBeachPost.com was launched. In June 2008, The Post’s leaders decided to focus on the core readership area of Palm Beach County and southern Martin County. As digital readership grows, print readership slows. Faced with economic downturn and a changing industry, The Post reduced its payroll of 1,350 to about 1,000 and closes bureaus in Stuart, Port St. Lucie and Delray Beach. In December 2008, The Post closed its presses and moved printing to the Deerfield Beach plant of the Fort Lauderdale Sun-Sentinel. In August 2018, The Post’s digital team launched the GateHouse Florida Digital Audience team to expand GateHouse’s digital audience across Florida. The Post has a weekly audience of approximately 600,000 in print and at PalmBeachPost.com each week. Approximately 6 million sessions are recorded each month on The Post’s family of websites. ^ E&P Staff (January 5, 2005). "'Palm Beach Post' Editor Edward Sears to Retire". Editor & Publisher. Retrieved June 1, 2014. 1 Cox Media Group operates this station under an LMA with Hoffmann Communications, Inc.
2 This subchannel holds a secondary affiliation with MeTV. 3 Sale pending to Terrier Media.